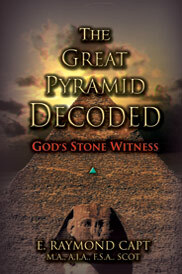 The Great Pyramid Decoded God's Stone Witness! The greatest archaeological discovery of all times decoded after 4500 years reveals geometric construction scientific features astronomical designs and pre-dates recorded knowledge by thousands of years. Jeremiah 32:20 states that God"...hast set signs and wonders in the land of Egypt even unto this day." In Egypt are found over 80 pyramids built over a period of 1000 years between the 27th and 18th centuries B.C. The most famous are the Pyramids of Giza. Only three are of any note or size and the smaller ones are now little more than ruins. Of these the largest is the Great Pyramid. Who hasn't wondered about the Great Pyramid of Giza? It has always ranked first among the pyramids of Egypt and is the only remaining one of the seven wonders of the ancient World. Thus it proves itself to be the greatest and most enduring of all. What story does it tell? The monuments of Egypt are covered with hieroglyphic writing. Their record may be easily read by the expert. The Great Pyramid in this respect is silent. If it has a message that message is not on the surface for any one to read...and forget. In our day Pyramidology with the aid of modern archaeology and scientific research has unlocked the secret of the Pyramid of Giza. The Great Pyramid stands decoded. It is the greatest archaeological study of all times. The evidences of this has been collected for us. There is no need for imagination or assumption. Let us analyze the evidence and translate it into as simple English as the technical nature of the subject matter will permit and then see if the following questions can be answered: Who was the architect? Does it have a Divine nature? Why was it called "The Bible in Stone"? Mr. Capt gives some astonishing answers to these questions and others as well.